The full moon occurred nearly five nights ago. But its effects weren’t felt until Thursday. On what seemed like a normal weekday, not much of it seemed normal at all. Even if your taste runs to steeplechases and low level claiming races, the manner in which Thursday’s card played out would have given you fits. On the surface, it appeared that the day started out rather predictably. Trainer Jonathan Sheppard, who wins most of the jumping events, saddled four horses – two in each of the races over hurdles. But the first horse that won was the one of the two he had entered that wasn’t supposed to, and the second was called by the name of the other so nobody knew who he was. Most handicappers pre-determined that Sheppard’s 2-1 Port Morsbey was better than Parker’s Project at 14-1 in the first race. But the two horses finished second-first instead of first-second. Parker’s Project romped home by over five lengths. Then in the second race, the Michael G. Walsh Novice Stakes, Sheppard struck again with Italian Wedding. But track announcer Tom Durkin said One Giant Step won. This wasn’t a mistake of not seeing a verdict by inches. Durkin merely mistook the second half of the 1 and 1A entry for the first. It didn’t help matters that the field was sent away without Durkin noticing. He apologized publicly, not diplomatically, by announcing “Whoa, they started the race,” as opposed to “They’re Off,” after the field had run several hundred yards. Take Down Two, a six-year-old shipper from Suffolk Downs making his sixtieth start, provided pause to wonder in the fourth race. Take Down Two’s trainer was also his jockey. Now how often does one see that? The answer, of course, is not very often – even less often than Take Down Two wins. This time around, he missed last by a nose thanks to Jacqueline Falk. The trainer/jockey used the whip to the finish. One other Falk – Arlene, who is Jacqueline’s mother, was listed as co-owner. 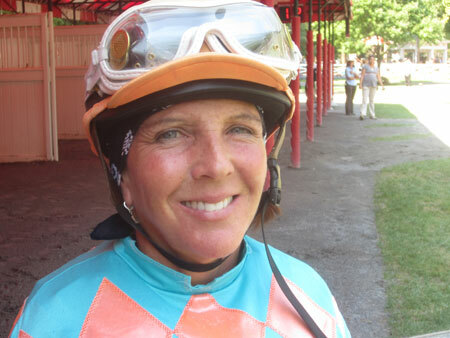 Jacqueline Falk is the trainer and jockey of Take Down Two. Her mother Arlene is the gelding's co-owner. Indian Tale, a three-year-old filly that Rick Dutrow Jr. claimed on August 7, made her fourth start in 11 days. She wanted no part of competition, however, and merely jogged ‘round the track in the fifth, finishing last. Chernobyl’s Hero, a candidate for worst-named horse, won the eighth race – a five-and-half furlongs sprint, when Retire to What drifted six paths across the homestretch and bumped him almost clear off the turf course. 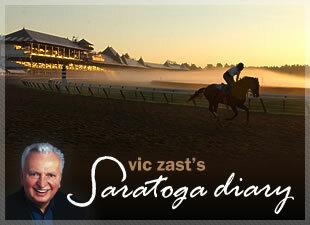 Friday, when there’ll be a return to normality, The Breast Cancer Research Foundation will host its Sizzling Hot Pink Saratoga Hat Luncheon in the Upper Carousel Restaurant. Jeannine Edwards will try to do what Tom Durkin couldn’t do – get the names right. The one she must get right, for sure, is Anne Campbell’s. Dogwood Stable’s First Lady is the honoree.